Furnish ______Rockford Model RP-SS______ all-welded stainless steel interceptors ______ g.p.m. intermittent flow, ______ lb. 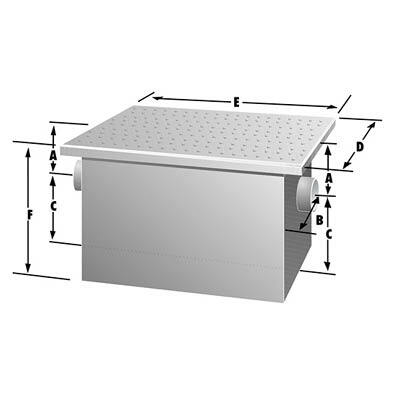 grease capacity, ______" no-hub inlet and outlet connections, cast-iron flow control device, removable nonskid diamond treadplate cover for flush-with-floor installation, secured with stainless steel flat head screws and heavy-duty leakproof gasket. Optional Features: Tapped inlet/outlet connections. These are stainless steel grease interceptors that have lifetime warranty. * Built in accordance with PDI G-101.